Our daughter Max is one half of our set of twins. This year Max and her brother are 15 years old. This is a big milestone in our little big girl’s life. We never thought 10 years ago that we would see this day. By the time Max was five years old; her mitochondrial disease had caused a crisis. She was in respiratory failure and we were advised to complete DNR instructions. But Max survived, and today we have a wonderful, intelligent 15 year old who knows a lot about mitochondrial disease. She knows she doesn’t have the energy to do what other kids her age do easily. 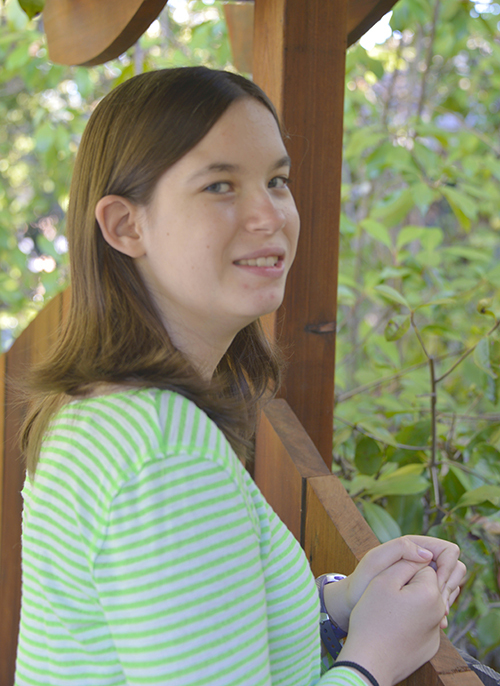 She understands mitochondrial disease has many different faces, and it presents more challenges for her than it does for her brother Chris, who also has the disease. Max is a fighter. The last year has been challenging for her. Her fatigue continues to be an increasing problem and she struggles with neurological issues as well as cardiomyopathy. Having a wheelchair and ventilator does not prevent her from exploring the world. This fall we will spend two months traveling as a family with two ventilators, one oxygen machine and Max’s wheelchair to Amsterdam, Paris, Barcelona and Berlin to explore and to study art history! Max continues to love science. Quantum Physics is her favorite branch of science. When not studying black hole theories, you’ll find Max listening to books and drawing and painting. This summer she again attended a pre-college program at the San Francisco Art Institute, this year called Painting and Permutations. It is our job to help our children fulfill their dreams. Success in mitochondrial research and finding a cure is critical for our children to live out their dreams. Please join us in supporting Seattle Children’s efforts on behalf of our kids.